We are an authorized dealer of Prism Medical ceiling lift systems. 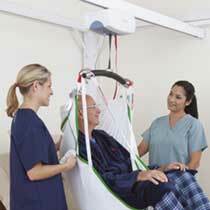 Prism ceiling lifts provide a sense of confidence to even the toughest patient transfers and reduce the anxiety, uncertainty, and discomfort that your caregivers face when repositioning or lifting a patient. As industry experts, Prism Medical, along with their network of installers have guided home caregivers throughout the process of implementing safe handling techniques. Prism Medical develops and manufactures a complete line of portable, fixed, free standing, and bariatric ceiling lifts. Because all Prism lifts are designed with the caregivers in mind, their ceiling lift systems require only minimal effort to operated and complete the transfer.